Surveillance is the close observation of a person, group of people, behaviours, activities, infrastructure, building etc for the purpose of managing, influencing, directing, or protecting. It should come as no surprise that one of the most immediate and promising applications of unmanned aerial vehicles, or drones, is in the area of surveillance. Drones are finest technology in the field of security. It provide a rapid response and fast "eyes on" to the target area with live updates control stations while active waypoint tracking can be maintained based on the target parameters, like thermal signatures. Drones can help monitor the movement of a crowd, predict the course of their progress and highlight particular ‘hot spots’ of trouble. In perimeter security, drones not only reduce the requirement for foot patrols by security guards, but also provide an additional oversight in instances where security personnel’s are deployed to ensure their adherence to patrolling routines. 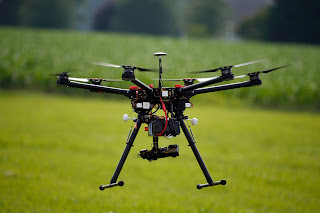 Drone planes can enter narrow and confined spaces, produce minimal noise, and can be equipped with night vision cameras and thermal sensors, allowing them to provide imagery that the human eye is unable to detect. This allows security forces to identify hazardous areas, potential assault locations and timings and evaluate piracy trends around the world.